This Power Hour Series offers insightful presentations from industry leaders on successful business practices to help members grow their business. Free underground parking is available. The Power Hour Series connects you with business experts in an intimate exchange of information and best practices to increase your competitiveness in today's economy. 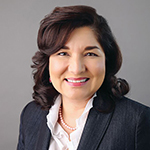 Maria S. Salinas is the new president & CEO of the L.A. Area Chamber, the largest business association in Los Angeles County representing more than 1,600 member companies and serving the interests of more than 235,000 businesses across the Los Angeles region. An accomplished business woman, entrepreneur and community leader, Salinas’ business acumen and financial expertise has led her to the boardrooms of community organizations, higher education institutions and community banks. Salinas has extensive experience in financial leadership with organizations including The Walt Disney Company, Ernst & Young and ProAmérica Bank. She is the founder of Salinas Consulting, which was awarded the 2010 Professional Services Award from the National Latina Business Women’s Association of Los Angeles, and Hispanas Organized for Political Equality (HOPE), a leading statewide organization promoting the advancement of Latinas.